Education is the most powerful weapon which you can use to change the world.!!! The Quest Backup Reporter is a windows client application. It can connect too many databases at a time and reports directly from oracle data dictionary views and RMAN catalog. It does not make any modification to either database as well as RMAN configuration. It is just a read only reporting tools. Quest Backup Reporter tools offers DBA a dashboard view of all oracle backup across one desktop view. 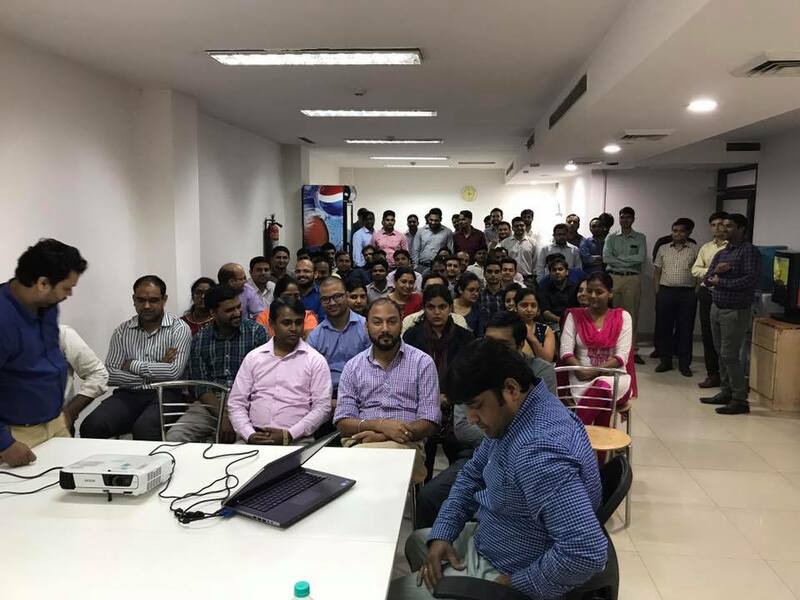 Thus it is relatively easy for the DBA who is managing different database backup to check all the backup status at a time (on single screen) and to ensure the backup are valid and recoverable. QBR supports oracle version 9i onwards and OS Windows Server2003/XP/Vista/Win7/Win Server 2008 (32 or 64). You can register target database using the menu Data source –> Register New Data source to access the information either through Control file or the RMAN catalog. Once the targets are registered then you are able to check time of the successful and failure backup as well as real time status of running backup. 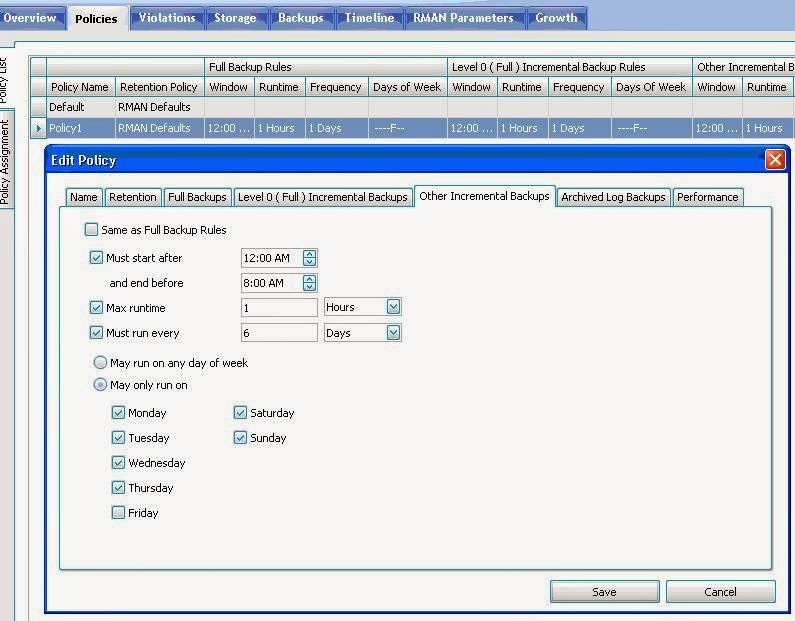 You can define policies if you need to meet backup with certain criteria such as retention period of backup of different types (full, level 0 and other incremental backup, archive log backup) and within various backup type you can define the days of the week as well as maximum run time. Once a policy has been applied to a target you can click on the violations tab to see the types and categories of violations. 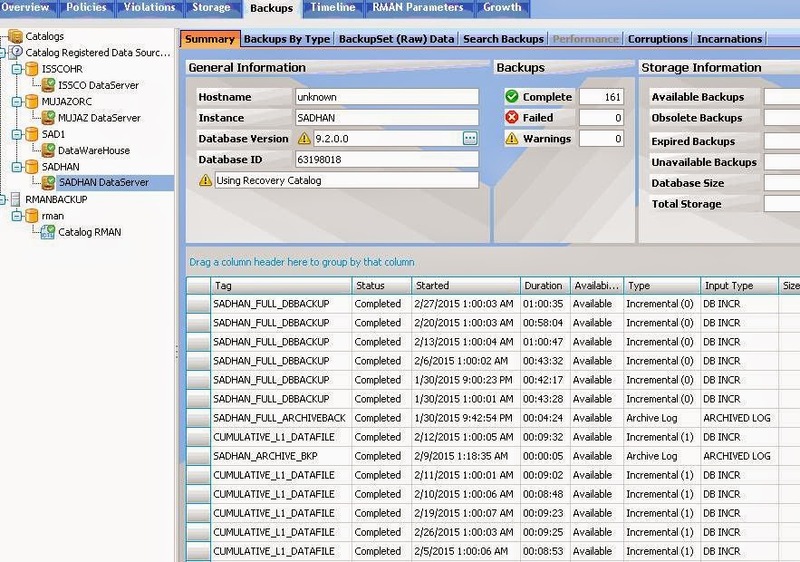 The Backup tab gives overview of the database backup as well as details of the particular backup. 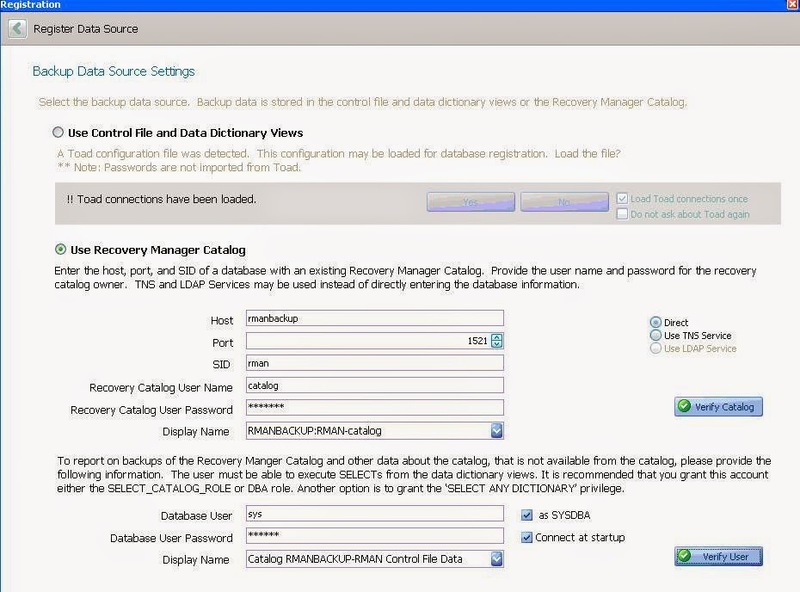 If you have already added recovery catalog you can see additional details of registered database. Another very useful feature of QBR is checking growth of the backup size corresponding to its duration and Timelines for each type of backup. Note: If you register more databases to QBR will take longer time to load them. This could results catalog database to slow and some other issues because it is continuously querying on the registered database catalog. Thank you for this valuable information. It was really helpful. This is just the kind of information that I had been looking for a long time. Thank you very much for posting this blog it’s very nice. How to Check Why Shutdown Immediate hangs or taking longer time? Use the above Search option for the Topics related Oracle DBA/Oracle D2K/Oracle Financial.. Awesome Inc. theme. Powered by Blogger.